NEX leverages an off-chain matching engine to enable faster and more complex trades across multiple blockchains such as NEO and Ethereum. NEX handles enormous trade volume through its unique publicly verifiable off-chain matching engine. The NEX payment service enables third-party smart contracts on NEO to send and receive global assets such as NEO and GAS as part of their computation. NEX handles complex order types that aren’t currently available on other decentralized exchanges such as market and limit orders. Exchange services are critical not just for users of cryptocurrencies, but also for many other applications built upon blockchain technology. NEX envisions a vibrant ecosystem of web-based decentralized applications (dApps) running across public blockchains such as NEO, Bitcoin, and Ethereum. These applications require tools to interact with, make transactions upon, and send data across chains. To achieve this vision, NEX is developing the first cross-chain browser extension. Web applications can use this extension to collect payments for goods in any digital currency, make trades and transactions across blockchains, and interact with smart contracts across NEO and Ethereum. All of this cross-chain functionality is powered and made possible by the NEX off-chain matching engine. NEX is issuing 50 million tokens to fund development and future expansion, of which 25 million will be sold to the public. NEX tokens are in the process of being registered as a security (first in Europe), and will provide holders with a share of all revenue generated by the exchange and related services. Revenue per user will be determined by the number of NEX tokens they hold and the length of time they commit to staking their tokens. The minimum fee share rate is 25%, increasing linearly to a maximum of 75% when tokens are staked for two years. Neon Exchange (NEX) is a platform for cryptocurrency trading (fully decentralized) and NEX also is a payment service on the NEO blockchain. One of the few projects I am really interested in to see how everything will play out for them. A project licensed to be a security and fully approved by the FMA of Liechtenstein. Their ICO was a big success during a bear market, partly due this first of a kind approval. 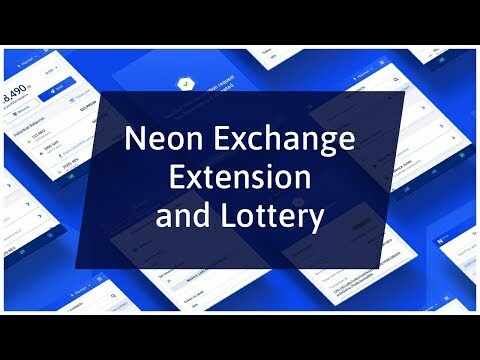 Looking at how the team has taken their time to do everything right and the idea of Neon Exchange I can only say that NEX will be a game changer. The team behind NEX has a vast knowledge and knows what they are doing and exactly knows how they should do it. Ethan is the creator of the NEON Wallet and also is the Co-Founder of City of Zion. Fabio and Fabian are also co-founders of CoZ. In their team of advisors they have Da Hongfei, the founder of NEO (!) and Erik Zhang, the CTO of Onchain and he is also part of the NEO council. Curious how they will continue developing their platform. Banking partner API template release.